We are changing the way pupils pay for school meals by replacing their Young Scot card with a personalised PIN number, unique to them. We are doing this to help reduce the queues at break and lunch time and make it easier to pay for food and drink within the school – benefiting them by making it simpler and quicker to make a purchase. In addition, the upgrade will also allow pupils to top up using new £1 coins and notes at the revaluation points. As from Monday 19 June 2017, pupils will no longer need to present their Young Scot card to pay for food or drink within the school or top-up their account. Instead they will enter a unique PIN number at the till-point which will be connected to their lunch money account. Their new six-digit PIN number will be issued to them during classes before break on Monday 19th June 2017. It is extremely important that your child keeps this number safe and does not share it with anyone. It is their responsibility to keep their own PIN safe as it links to their school lunch money account – if they share or misuse their new PIN number, any money on their account cannot be replaced. This system will continue to allow pupils to bring cash into school to credit their lunch money account but we intend to phase out the use of cash for the purchase of school lunches from August (once the new Parent Pay system is introduced). 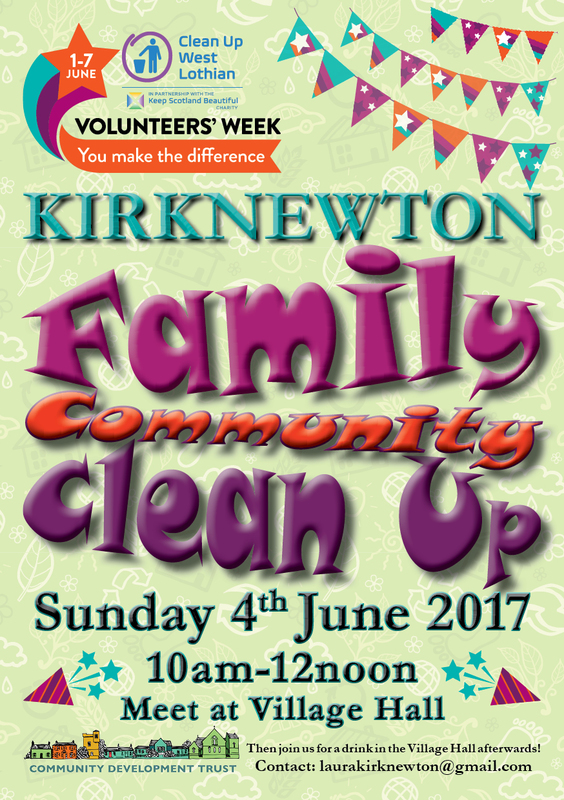 ≈ Comments Off on Kirknewton Clean Up! 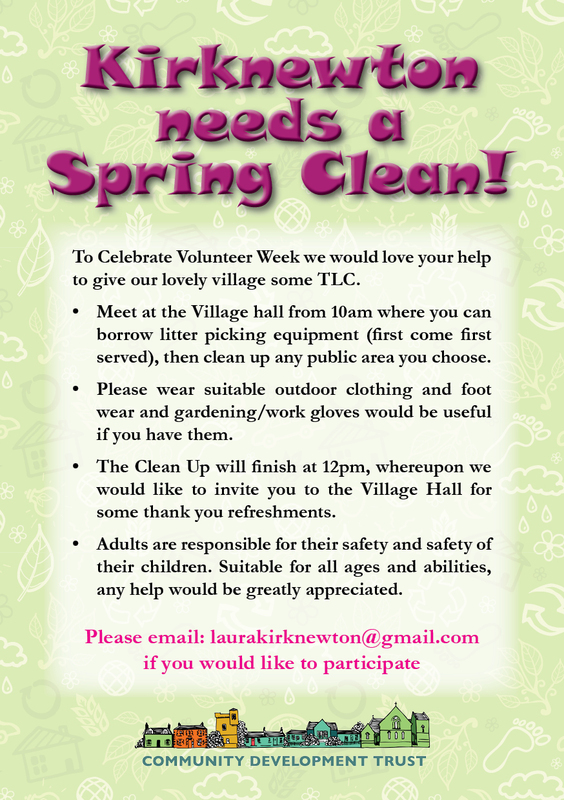 Information from Kirknewton Community Development Trust. Tickets will go on sale for the Wednesday and Thursday night from the school reception on Wednesday 8th March and will be priced at £5 for adults and £3 for under 18’s. Tuesday night will be a ‘practise night’ where we will run it as a final performance for a donation on the door. As there is no cost associated with the dance club and the only way we make funds is through the annual show, I would ask all pupils to contribute to the bake sale at the interval. All pupils whose tutor ends in a 1, e.g. 1M1, 2C1 etc bake for the Wednesday night and pupils whose tutor ends in a 2 e.g. 3B2, 1M2 bake for the Thursday night. Pupils should be there sharp on Saturday for an 11.00am start and should be in school on the show nights for 6.00pm. Please ensure your child has with them all costumes, a snack and plenty of water. All pupils will be required to wear their black dance t-shirt or a plain black top and black leggings / trackies for the finale. I would appreciate any support parents can offer in terms of supervising pupils backstage, helping at the interval or general help back stage. Please let me know if you are able to help on any of the nights. Thanks as ever for your support of the dance club, I look forward to seeing you during the show week. We have organised for a new online booking system for our parents’ evenings. Our next event is on Thursday 9 February for S5/6. The system is live TODAY and will be open to take your bookings until Monday 6 February at 9.00pm. You can book for Parents’ Evenings as soon as you receive this letter. Once you have logged in, we suggest you use the ‘Automated Booking’ wizard to make your appointments. You will be asked to enter your availability and choose which teachers you want to see before being shown the most efficient order for visiting those teachers on the night. If you are unable to book at home, please phone the office and a member of staff will help you. We would like to invite you to attend our course choice information evening for parents of S4/5 pupils who will soon be making subject choices for S5/6 next session. The aim of the evening is to help you to understand the process in school, how and why decisions might be made and how we can work together to ensure the best possible outcomes for our children/pupils. Please note that the column choice information will not be available until later in the term. We look forward to welcoming you on Wednesday 1 February at 6.00pm in the Drama Studio.